After working on some more samples this week’s triangular feather stitch sampler is completed. 6. 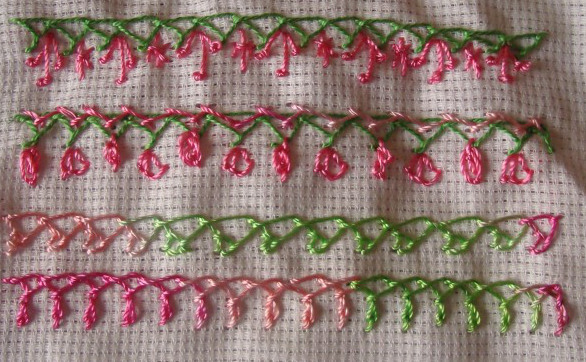 In these rows, the triangles are worked in the same manner, the variations are only on the basic feather stitches.The first row is worked with up and down feather stitch. In the second row, the feather stitches are facing away from each other, making the first feather stitches look like chain stitches [ this detail is to remind me at a later date, the working of this sample] . The third row is worked with knotted feather stitches. 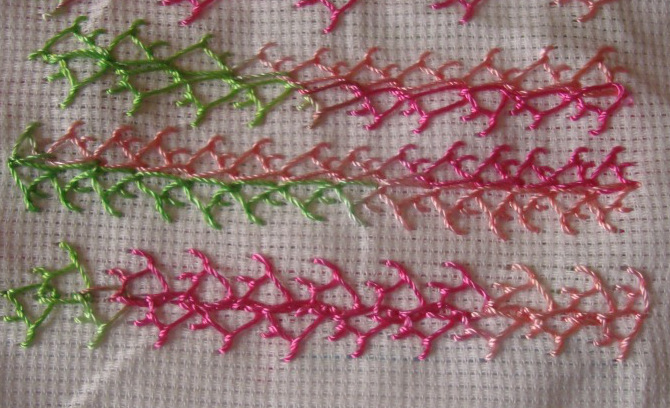 7 .In these samples, other TAST stitches are worked with triangular feather stitches. The other stitches are-french knots and Italian border stitches in the first row, wheat ear and fly stitches in the second row, chain and arrowhead stitch in the third row. 8 .The first row is worked with pistil stitches and sheaf stitches, the second row with herringbone, buttonhole variation and oyster stitches . Maintaining the triangular part of this stitch I tried working two other stitches. In the third row, with closed buttonhole stitches and in the fourth row with basque stitches. I suppose we can try many options working like this. With this last sample, the stitch sampler is completed. I worked some more samples of this stitch today. 3.Three feather stitches are worked on one side in the first row. Worked a single feather stitch and continued with the triangular feather stitch in the second row. Triangular feather stitches worked on both sides in the third row. 4.Two rows of triangular feather stitches are worked together in three different ways in these samples. 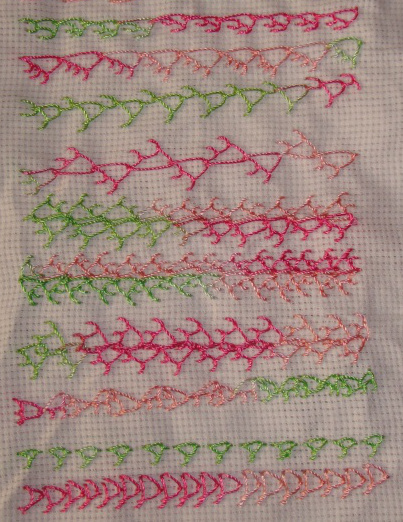 5.In the first row, I tried working triangular feather stitches in zigzag way [not very pretty]. The second row is individually worked triangular feather stitches. [ This type of working feather stitches is very common in ethnic Gujarathi embroidery. They form beautiful decorative seam when worked with single strand of white thread.]. And the individual feather stitches are worked one after another in the third row. 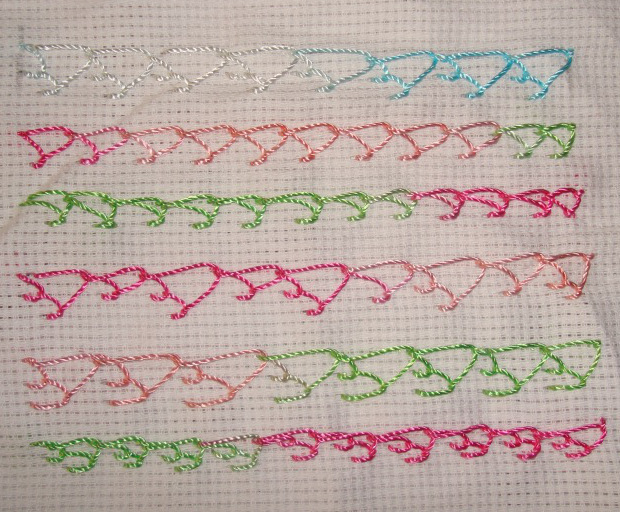 1.I tried working this stitch by varying the number of stitches and the angles. 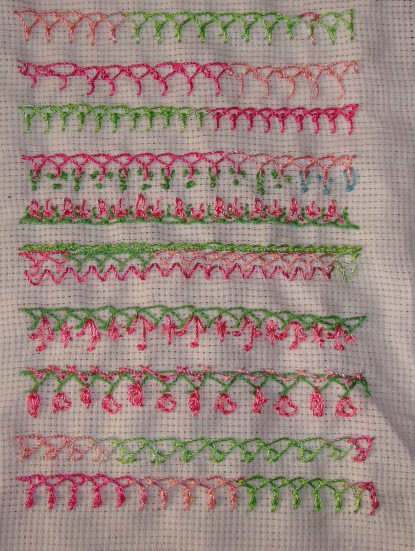 the first row , is the way the stitch is done on Sharon’s blog. In the second row, I worked single feather stitch on one side. In the third row, the feather stitch which completed the triangle, is worked at right angle. 2.In the first row, I alternated between single and double feather stitches. In the second row, the second feather stitch is extended up to the first feather stitch. The feather stitch making the triangle is worked at right angle in this third row too.